, denominated sometimes Ju­Nior, but commonly called Dean Harry, to distinguish him from the preceding, was the son of the rev. William Wilkinson of Adwick, or Adwickstreet, in the West Riding of Yorkshire, the brother of the first Henry Wilkinson, rector of Waddesdon; and consequently cousin to the preceding Long Harry. He was born at Adwick in 1616, and was educated in grammar at a school in All Saints parish, Oxford. He entered a commoner of Magdalen-hall in 1631, took the degrees in arts, was admitted into holy orders, and became a noted tutor, and moderator or dean of Magdalen-hall. Being of the same principles with his relations, he quitted the university in 1642, and going to London, took the covenant, and became a frequent preacher. On the surrender of Oxford to the parliamentary forces, he returned thither, and was created bachelor of divinity, and made principal of his hall, and moral philosophy reader of the university. He also took the degree of D. D. and became a frequent preacher at the different churches in Oxford. 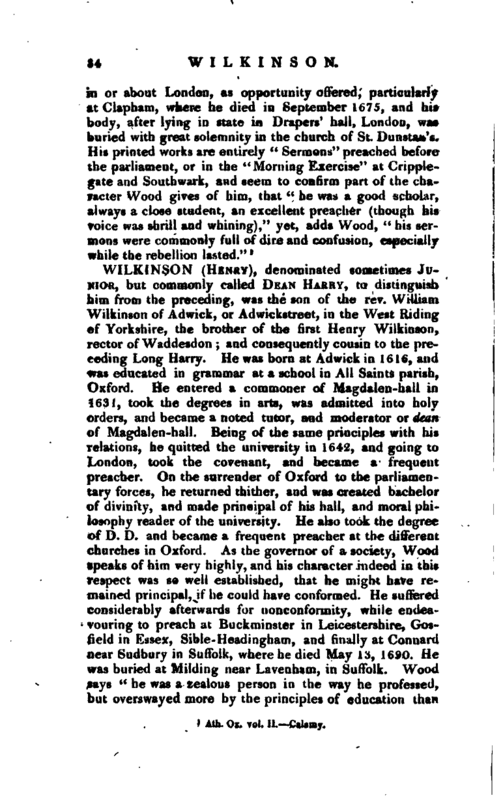 As the governor of a society, Wood ipeaks of him very highly, and his character indeed in this respect was so well established, that he might have remained principal, if he could have conformed. He suffered considerably afterwards for nonconformity, while endeavouring to preach at Buckminster in Leicestershire, Gosfield in Essex, Sible-Headingham, and finally at Connard near Sudbury in Suffolk, where he died May 13, 1690. He was buried at Milding near Lavenham, in Suffolk. Wood says “he was a zealous person in the way he professed, but overswayed more by the principles of education than | reason. 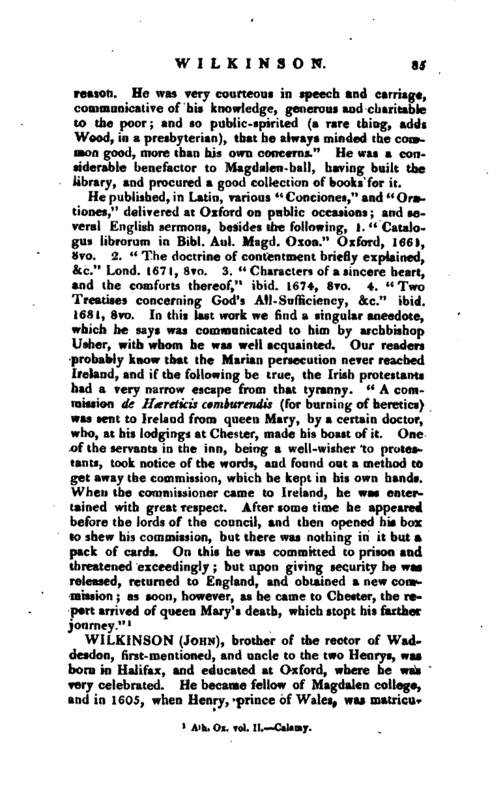 He was very courteous in speech and carriage, communicative of his knowledge, generous and charitable to the poor; and so public-spirited (a rare thing, adds Wood, in a presbyterian), that he always minded the common good, more than his own concerns.” He was a considerable benefactor to Magdalen -hall, having built the library, and procured a good collection of books for it.